There is a new more powerful ASIC miner from Baikal Miner that supports multiple algorithms for mining, the new Baikal Miner BK-G28 is a more powerful successor of the previous BK-X model that the company was selling up until recently. The new BK-G28 is almost 3 times faster in terms of performance on all supported algorithms and adds Groestl support on top of the already supported other algos. 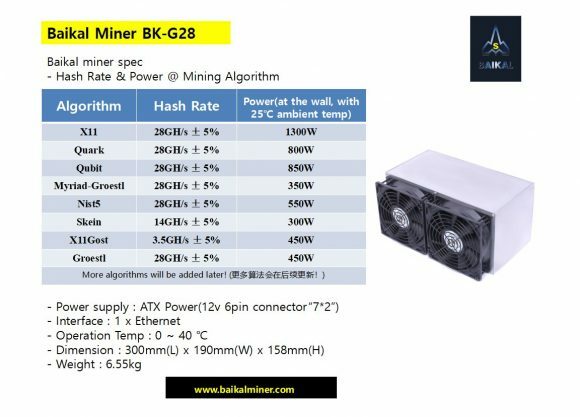 With the Baikal Miner BK-G28 you can get up to 28 GHS mining performance on X11, Quark, Qubit, Myriad-Groestl, Nist5 and Groestl with varying power consumption. The hashrate for Skein is at 14 GHS and for mining X11Ghost you can expect to get about 3.5 GHS. Baikal Miner is already taking orders for the new hardware, though they do not cite official price for the device yet. Currently it is most interesting and profitable choice for the new BK-G28 is to be used for the Groestl algorithm, however a big number of these ASIC mines will easily reduce profitability in not time. Mining Groestl in GPUs is obviously getting depreciated, as most likely Baikal Miner will soon add support for Groestl for the owners of BK-X ASICs as well… most likely as son as they sell enough BK-G28s.